Is it still possible to build a better mouse trap? Engineering students at UC Merced think so. “Eraticate” — a fitting name for a group focused on mouse trap optimization — isn’t concerned with the cliché their project evokes. Instead, they’re hoping that their multi-kill mouse trap finally ends the rodent problem that remains a perennial source of anxiety for farmers and food producers throughout California’s Central Valley. But Eraticate isn’t the only team addressing the problems endemic to California’s Central Valley; they are one of 20 teams who will showcase their capstone projects Friday at UC Merced’s Innovate to Grow. Equal parts competition and exhibition, Innovate to Grow highlights student efforts in engineering, design, entrepreneurship and education, and awards those teams whose accomplishments are especially noteworthy. Innovate to Grow was launched in 2012 as an expo to spotlight the achievements of graduating seniors who had completed the School of Engineering’s capstone requirement. Now in its sixth year, the annual event has expanded to include the Innovation Design Clinic, the Mobile App Challenge and the Engineering Service Learning initiative. “Each of these programs offers students an opportunity to work on a team-based design project that is intended to have a practical objective,” School of Engineering Dean Mark Matsumoto explained. 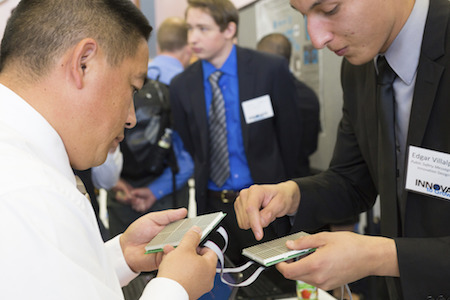 The Innovation Design Clinic (IDC) offers graduating seniors a unique capstone experience. Rather than pursuing individualized projects, IDC participants form teams that partner with local organizations to find innovative solutions to problems confronting Central Valley industries and communities. The projects combine engineering with entrepreneurship to address issues that have a significant impact on the region’s economy. Plus, it provides many students with their first glimpse of real-world engineering. “Having a well-rounded curriculum such as a capstone project that includes presentation skills, engineering application, budgeting, teamwork, logistical planning and manufacturing, solidifies what we've learned the past several years,” said mechanical engineering senior and IDC participant Alexis Avila. Likewise, students in the Mobile App Challenge — organized by the Center for Information Technology Research in the Interest of Society (CITRIS) — recognize that there isn’t an app for everything. Participants work in teams to develop mobile apps that address real-world issues. In the process, students come to understand the engineering, design and entrepreneurship challenges associated with developing and promoting a new mobile app. More cornerstone than capstone, the Engineering Service Learning initiative is targeted toward engineering students early in their college careers. Teams work in conjunction with local nonprofits to apply the principles of engineering and design to improve the wellbeing of local communities. Projects are varied, and include assisting local shelters with case management technology, developing apps that help communities assess the health of their local economies, and developing technologies to improve doctor-patient communication. But Innovate to Grow is more than just a showcase of engineering ingenuity. For many first-generation students, it’s their first opportunity to experience the realities of an engineering career. Innovate to Grow will be held on Friday, May 12 at the Joseph Edward Gallo Recreation and Wellness Center. The event is free and open to the public, but attendees must register in advance. For more information, visit the Innovate to Grow website.